TCP Work Orders allow administrators/foreman to easily create internal or external work orders. Work Orders can be assigned to an indvidual with priority and due date. Work Orders also have the "sign with finger" technology for approval and workflow. Full reporting against work orders are available to administrators. TCP's Work Authorizations allow for the continuous movement forward of production. 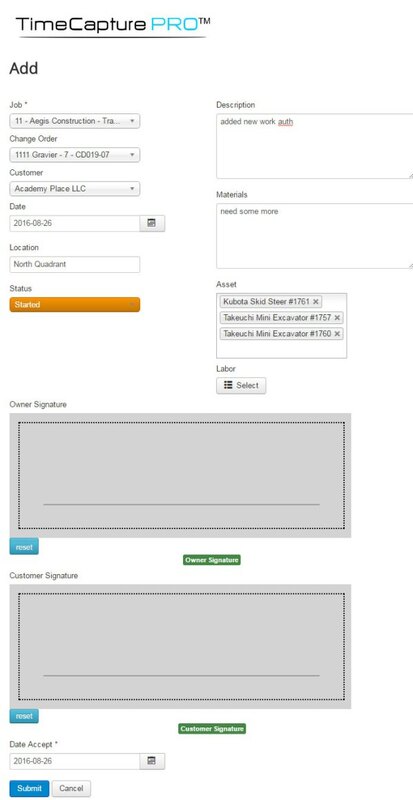 Now foreman can authorize additional work right from the job site with detailed information and "sign with your finger" technology. 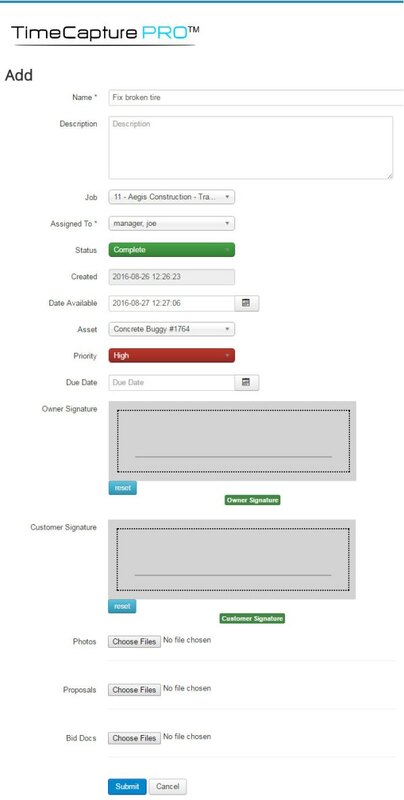 All Work Authorizations can be emailed directly to the customer with their signature in the PDF! Large team? No more sign in sheets. TimeCapture PRO uses "sign with your finger" technology + geo tracking to capture who's clocking in, where and when. No more signing in for your buddy. Plus, when workers clock out they are asked specifically if lunch was taken and whether they were injured. If they designate injury, an email blast goes out to all supervisors to remedy the sittuation. For those employees that are allowed to designate their own time without clocking in and out, there's Time Logger. TCP's time logger allows each employee to designate the amount of time they spent per job/task/tracking code. All employees are responsible for entering in their own time. Time isn't entered, they don't get paid. Keeps accounting happy with up-to-date information. Not to mention for administrator tracking time spent per job. TCP allows your workforce to capture receipts directly from their phone/tablet. Your employee simply fills in the Label, Job, Cost and takes a photo directly from the phone. The receipt is then submitted to the back office for approval.